Over the last 7 days, the Greater New York Red Cross provided emergency assistance to 69 adults and 15 children following 34 local disasters. Here are some highlights from last week and a preview of upcoming events (see below). On Saturday, Red Cross volunteers were out in Staten Island installing free smoke alarms in the community as part of the ongoing Home Fire Preparedness Safety campaign. On Thursday, the Greater New York Red Cross opened up a call center to help support the high volume of calls from people seeking assistance and information from the ongoing storm relief operation spanning Oklahoma City to Houston. Tuesday evening, NBC4’s Janice Huff sat down with our regional CEO, Josh Lockwood to discuss the importance of preparing for the upcoming hurricane season. Tuesday morning, our proud volunteers showed up at the Today Show to help promote Red Cross Giving Day, which help raise $2,445,106 #allin1day! On Monday, Red Cross caseworkers had a busy day at HQ assisting dozens of residents from a Lower East Side Chinatown fire that forced them to vacate their homes. 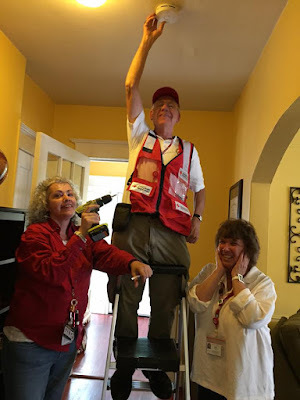 With the help of rockstar volunteer Richard Sanford, the Red Cross was also able to provide translation services to those residents in Mandarin Chinese! June 8, 11: Red Cross blood drives; 1 to 7pm; 520 West 49th Street, Manhattan. Schedule an appointment to donate today. June 8-12: Out in Greenwich, CT, Safety Town kicks-off a week long program that teaches accident prevention skills to local pre-school kids before they enter kindergarten. June 10, 11: Volunteers are needed to support the upcoming Home Fire Preparedness Campaign events. Wednesday, June 10 volunteers will return to Staten Island and Thursday, June 11 to the Bronx to install free smoke alarms and ultimately reduce injuries and deaths due to home fires. If you’d like to volunteer for the campaign, sign up on our website by selecting “Home Fire Preparedness Campaign Volunteer.” Current volunteers should sign up through Volunteer Connection.